Definition at line 45 of file LiveVariables.h. Definition at line 48 of file LiveVariables.h. addNewBlock - Add a new basic block BB between DomBB and SuccBB. addNewBlock - Add a new basic block BB as an empty succcessor to DomBB. All variables that are live out of DomBB and live into SuccBB will be marked as passing live through BB. This method assumes that the machine code is still in SSA form. All variables that are live out of DomBB will be marked as passing live through BB. Definition at line 764 of file LiveVariables.cpp. References llvm::LiveVariables::VarInfo::AliveBlocks, llvm::MachineBasicBlock::begin(), llvm::detail::DenseSetImpl< ValueT, MapTy, ValueInfoT >::count(), E, llvm::MachineBasicBlock::end(), llvm::MachineBasicBlock::getNumber(), getVarInfo(), I, llvm::TargetRegisterInfo::index2VirtReg(), llvm::detail::DenseSetImpl< ValueT, MapTy, ValueInfoT >::insert(), llvm::TargetRegisterInfo::isVirtualRegister(), llvm::LiveVariables::VarInfo::Kills, MRI, llvm::SparseBitVector< ElementSize >::set(), llvm::SparseBitVector< ElementSize >::test(), and VI. Referenced by isLiveIn(), and llvm::MachineBasicBlock::SplitCriticalEdge(). addVirtualRegisterDead - Add information about the fact that the specified register is dead after being used by the specified instruction. If AddIfNotFound is true, add a implicit operand if it's not found. Definition at line 236 of file LiveVariables.h. References llvm::MachineInstr::addRegisterDead(), getVarInfo(), and llvm::LiveVariables::VarInfo::Kills. addVirtualRegisterKilled - Add information about the fact that the specified register is killed after being used by the specified instruction. 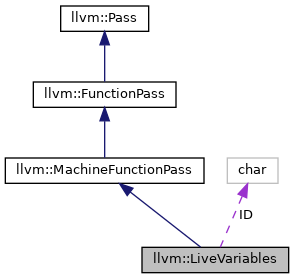 Definition at line 200 of file LiveVariables.h. References llvm::MachineInstr::addRegisterKilled(), getVarInfo(), and llvm::LiveVariables::VarInfo::Kills. Definition at line 52 of file LiveVariables.cpp. getVarInfo - Return the VarInfo structure for the specified VIRTUAL register. getVarInfo - Get (possibly creating) a VarInfo object for the given vreg. Definition at line 84 of file LiveVariables.cpp. Referenced by addNewBlock(), addVirtualRegisterDead(), addVirtualRegisterKilled(), llvm::X86InstrInfo::classifyLEAReg(), llvm::ARMBaseInstrInfo::convertToThreeAddress(), HandleVirtRegDef(), HandleVirtRegUse(), isLiveIn(), isLiveOut(), matchPair(), regOverlapsSet(), releaseMemory(), removeVirtualRegisterDead(), removeVirtualRegisterKilled(), removeVirtualRegistersKilled(), replaceKillInstruction(), and llvm::MachineBasicBlock::SplitCriticalEdge(). Definition at line 181 of file LiveVariables.cpp. References llvm::MachineInstr::addOperand(), llvm::MachineInstr::addRegisterDead(), llvm::MachineInstr::addRegisterKilled(), llvm::LiveVariables::VarInfo::AliveBlocks, assert(), llvm::SmallVectorTemplateCommon< T, typename >::back(), llvm::SmallVectorTemplateCommon< T, typename >::begin(), llvm::MachineOperand::clobbersPhysReg(), llvm::SmallSet< T, N, C >::count(), llvm::MachineOperand::CreateReg(), llvm::tgtok::Def, E, llvm::SmallVectorBase::empty(), llvm::SparseBitVector< ElementSize >::empty(), llvm::SmallVectorTemplateCommon< T, typename >::end(), llvm::SmallSet< T, N, C >::erase(), llvm::MachineInstr::findRegisterDefOperand(), llvm::MachineInstr::getNumOperands(), llvm::MachineInstr::getOperand(), llvm::MachineInstr::getParent(), llvm::MachineOperand::getReg(), getVarInfo(), HandleVirtRegUse(), I, llvm::SmallSet< T, N, C >::insert(), llvm::MachineOperand::isDead(), llvm::MachineInstr::isDebugInstr(), llvm::MachineOperand::isDef(), llvm::MachineOperand::isEarlyClobber(), llvm::MachineBasicBlock::isEHPad(), llvm::MachineInstr::isPHI(), llvm::TargetRegisterInfo::isPhysicalRegister(), llvm::MachineOperand::isReg(), llvm::MachineOperand::isRegMask(), llvm::MachineOperand::isUse(), llvm::MCRegisterInfo::DiffListIterator::isValid(), llvm::TargetRegisterInfo::isVirtualRegister(), llvm::LiveVariables::VarInfo::Kills, llvm::MachineBasicBlock::liveins(), MarkVirtRegAliveInBlock(), MI, MRI, llvm::SmallVectorTemplateBase< T, bool >::pop_back(), llvm::SmallVectorTemplateBase< T >::push_back(), llvm::SmallVectorTemplateBase< T, bool >::push_back(), llvm::MachineOperand::readsReg(), Reg, llvm::MachineOperand::setIsDead(), llvm::MachineOperand::setIsEarlyClobber(), llvm::MachineOperand::setIsKill(), SI, llvm::SmallVectorBase::size(), SubReg, and TRI. Definition at line 130 of file LiveVariables.cpp. References llvm::LiveVariables::VarInfo::AliveBlocks, assert(), E, llvm::MachineBasicBlock::getNumber(), getVarInfo(), llvm::LiveVariables::VarInfo::Kills, MarkVirtRegAliveInBlock(), MI, MRI, llvm::MachineBasicBlock::pred_begin(), llvm::MachineBasicBlock::pred_end(), and llvm::SparseBitVector< ElementSize >::test(). Referenced by HandleVirtRegDef(), and releaseMemory(). Definition at line 282 of file LiveVariables.h. References addNewBlock(), getVarInfo(), llvm::LiveVariables::VarInfo::isLiveIn(), and isLiveOut(). isLiveOut - Determine if Reg is live out from MBB, when not considering PHI nodes. 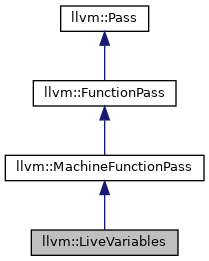 This means that Reg is either killed by a successor block or passed through one. Definition at line 739 of file LiveVariables.cpp. References llvm::LiveVariables::VarInfo::AliveBlocks, llvm::SmallPtrSetImpl< PtrType >::count(), getVarInfo(), llvm::SmallPtrSetImpl< PtrType >::insert(), llvm::LiveVariables::VarInfo::Kills, llvm::MachineBasicBlock::successors(), llvm::SparseBitVector< ElementSize >::test(), and VI. isPHIJoin - Return true if Reg is a phi join register. Definition at line 300 of file LiveVariables.h. Definition at line 117 of file LiveVariables.cpp. Referenced by HandleVirtRegDef(), HandleVirtRegUse(), and releaseMemory(). Definition at line 91 of file LiveVariables.cpp. References llvm::LiveVariables::VarInfo::AliveBlocks, assert(), llvm::MachineBasicBlock::front(), llvm::MachineBasicBlock::getNumber(), llvm::LiveVariables::VarInfo::Kills, llvm::MachineBasicBlock::pred_rbegin(), llvm::MachineBasicBlock::pred_rend(), llvm::SparseBitVector< ElementSize >::set(), and llvm::SparseBitVector< ElementSize >::test(). RegisterDefIsDead - Return true if the specified instruction defines the specified register, but that definition is dead. Definition at line 266 of file LiveVariables.h. References llvm::IndexedMap< T, ToIndexT >::clear(), getVarInfo(), HandleVirtRegDef(), HandleVirtRegUse(), and MarkVirtRegAliveInBlock(). removeVirtualRegisterDead - Remove the specified kill of the virtual register from the live variable information. Returns true if the variable was marked dead at the specified instruction, false otherwise. Definition at line 246 of file LiveVariables.h. References assert(), getAnalysisUsage(), llvm::MachineInstr::getNumOperands(), llvm::MachineInstr::getOperand(), llvm::MachineOperand::getReg(), getVarInfo(), llvm::MachineOperand::isDef(), llvm::MachineOperand::isReg(), llvm::LiveVariables::VarInfo::removeKill(), and llvm::MachineOperand::setIsDead(). removeVirtualRegisterKilled - Remove the specified kill of the virtual register from the live variable information. Returns true if the variable was marked as killed by the specified instruction, false otherwise. Definition at line 210 of file LiveVariables.h. References assert(), llvm::MachineInstr::getNumOperands(), llvm::MachineInstr::getOperand(), llvm::MachineOperand::getReg(), getVarInfo(), llvm::MachineOperand::isKill(), llvm::MachineOperand::isReg(), llvm::LiveVariables::VarInfo::removeKill(), removeVirtualRegistersKilled(), and llvm::MachineOperand::setIsKill(). removeVirtualRegistersKilled - Remove all killed info for the specified instruction. Definition at line 690 of file LiveVariables.cpp. References assert(), llvm::MachineInstr::getNumOperands(), llvm::MachineInstr::getOperand(), llvm::MachineOperand::getReg(), getVarInfo(), llvm::MachineOperand::isKill(), llvm::MachineOperand::isReg(), llvm::TargetRegisterInfo::isVirtualRegister(), llvm::LiveVariables::VarInfo::removeKill(), and llvm::MachineOperand::setIsKill(). replaceKillInstruction - Update register kill info by replacing a kill instruction with a new one. Definition at line 682 of file LiveVariables.cpp. References getVarInfo(), llvm::LiveVariables::VarInfo::Kills, replace(), and VI. Referenced by llvm::X86InstrInfo::classifyLEAReg(), llvm::X86InstrInfo::convertToThreeAddress(), finishConvertToThreeAddress(), and llvm::LiveVariables::VarInfo::removeKill(). Definition at line 621 of file LiveVariables.cpp. References assert(), llvm::SmallPtrSetImpl< NodeRef >::count(), llvm::depth_first_ext(), llvm::MachineFunction::getRegInfo(), llvm::TargetRegisterInfo::index2VirtReg(), llvm::LiveVariables::VarInfo::Kills, MRI, Reg, llvm::report_fatal_error(), and TRI. setPHIJoin - Mark Reg as a phi join register. Definition at line 303 of file LiveVariables.h. Definition at line 47 of file LiveVariables.h.